When we think of something or someone as being disruptive our first reaction may be to paint a negative picture. It could be a child acting inappropriately in church or a winter storm that ices roads and forces an evening of cancellations. It could even be something as simple as a telephone ringing that interrupts our train of thought. Regardless of the image that comes to mind, disruptions tend to be things we want to minimize in our lives. In technology circles, the term disruptive often has the opposite connotation when put into practice. Think about some disruptive technologies that have come about in the last several decades, the microprocessor, the microwave oven, cable television, the Internet. The introduction of these technologies all spawned entire industries around them. Disruptive is a term commonly used to describe mobile learning. Why is mobile learning considered disruptive and is this type of disruption a good thing? Answering these questions requires first understanding what is meant by the term disruptive in the context of mobile learning. Next is to determine how mobile learning fits into this definition and finally investigating the implications to businesses and others looking to implement mobile learning must be understood. Once these three areas have been reviewed sufficiently, it is then possible to decide how mobile learning fits into an organization. This month’s newsletter looks at the first two areas: what is meant by the term disruptive in the context of mobile learning, and ways in which mobile learning is disruptive. The November newsletter, examines how mobile learning is impacting businesses and what the implications are in terms of decision making, personnel, and technology expenditures. What is meant by disruptive? Looking up disruptive in the dictionary reveals references back to the word disrupt. Looking up disrupt, the World English Dictionary offers this definition: “(v) to throw into turmoil or disorder.” While there could be some of this with mobile learning, this definition does not truly capture what is meant by calling mobile learning disruptive. First, disruptive products are simpler and cheaper; they generally promise lower margins, not greater profits. Second, disruptive technologies typically are first commercialized in emerging or insignificant markets. And third, leading firms’ most profitable customers generally don’t want, and indeed initially can’t use, products based on disruptive technologies. Here again, is a definition that doesn’t really seem to fit. Mobile learning may be less expensive in many instances, but the underlying technology certainly is not simple or is it simpler than current learning technologies. Furthermore, mobile learning has significant implications to large and mature markets just as much as it does to emerging and insignificant markets. James Burke, who wrote and hosted the PBS Series, Connections, explains disruptions occurring from coincidental inventions, changes in regulations and society, exploding demand for new products as well as growth in complementary technologies created through strange connections. deliberate response to the interruption. Of course, one response to a disruption is to ignore it altogether, a cell phone going off in a meeting, for instance, but that decision is always conscious and deliberate. This definition is very broad, very deep and very pervasive, but it easily fits a number of technologies and events that have been commonly referred to as disruptive. The rapid adoption of DVD technology in the early 2000’s forced consumers to decide not only which device they would need to purchase for watching movies at home but also which format they would invest in for the media itself. Then along comes streaming video like Netflix, and the disruption and upheaval in the market begins again. With all of this in mind, mobile learning is disruptive in the sense that it significantly interrupts our approaches, ideas and thoughts on how best to develop and deliver learning content. 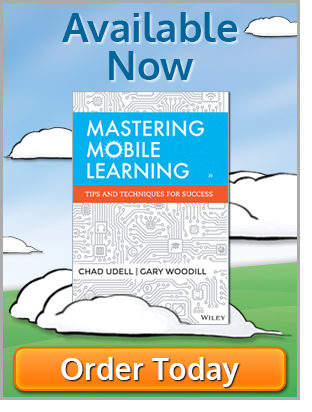 How is mobile learning disruptive? There are a number of ways that mobile learning is interrupting the normal flow of our activities, thoughts and ideals and each of these contribute to mobile learning being disruptive. Mobile devices are ubiquitous. The evidence is clear, mobile technology is becoming more and more pervasive in people’s daily lives. For many individuals, their cell phone is the first thing they look at in the morning and the last thing they check before going to bed. How often do we sit in a meeting people sit in a meeting and see people checking their email, sending a text message or looking up additional information related to the presentation or discussion at hand? The fact is, every day humans are becoming more and more dependent on mobile devices to the point that they don’t even realize just how much they use them to learn. Take for instance turn-by-turn navigation, whether it is a dedicated device such as a Garmin or TomTom, or if it is the navigation system built directly into an Android device. When a destination is programmed in, there is an expectation that the device will show how to get to the location directly, quickly and accurately. If it is a friend’s new home or somewhere we never plan to go again, there is still learning occurring in the sense of how to get to the destination including any alternate routes that may be available. The point is, regardless of how much people realize it or how deliberate they are in their use, mobile devices are playing a big role in helping individuals learn and discover new things every day. Mobile learning is challenging traditional views of teaching – For hundreds of years, teaching has focused on the concept of “learn now, use later” or in some cases “learn now, just in case.” These ideas, which have driven the design of many learning theories, have a strong emphasis on memorization and retention. For instance, many would agree on the importance of learning CPR, but unless you work in the medical field, this knowledge is something we hope never to have to use. Mobile devices, however, are proving to be great for the notion of “need now, learn now.” Many of today’s Automatic External Defibrillators (AEDs), which are becoming more prevalent especially in places like public buildings and larger companies, have voice synthesis built in that will actually walk you through the process of using the device and giving CPR. This is not to suggest that CPR training is no longer necessary, but now the in-class instruction can focus more on proper technique and less on memorizing the exact cadence and timing of the breaths and compressions. Mobile devices are enabling more self-directed learning – Most learning theory is based on the principle of an instructor and a student. The instructor determines the learning objectives, the curriculum and the pedagogy to be used. The student is then the recipient of this information in the form of instruction. The instruction can happen in a classroom or on a computer in the form of eLearning. It doesn’t matter; the learning content is predetermined by someone other than the learner. With mobile learning, instruction can be very personal and individual. Imagine two people in downtown Chicago standing in front of the Willis Tower (formerly the Sears Tower). One may be very interested in the history and physical aspects of the skyscraper, when it was built, how tall it is, why the name was changed, etc. The other person may be interested in knowing how the building has been used, what corporations have had offices there, the cost to lease space and the historical occupancy rate. In this case, each individual is learning what matters and is most relevant to them. Their learning is not being dictated by what someone else thinks is important. Mobile devices are changing how and when information is accessed – Let’s say a parent is waiting to pick up their child from school. They hear a song on the radio and are really interested in who the artist is. Fifteen years ago, aside from hoping the DJ says the name and artist or waiting until they are home to call the radio station, this person may be out of luck. Today, with Shazam loaded on a smartphone, not only is the name and artist of the song available, but it is possible to instantly purchase the song or album, find tour information for the artist, read reviews and a find whole host of additional information right from the app. Carry this technology a little further and imagine someone heading to a business meeting two hours away. They suddenly hear a noise coming from the engine compartment of the car and they are not sure if it serious enough to warrant stopping and having it looked at or if they can keep going in order to make it to the meeting on time. Can a cell phone actually help diagnose a problem with the car? While an application like this doesn’t appear to exist today, the technology certainly makes it seem possible. Mobile devices are having an enormous impact, interrupting long-held approaches to how people learn, what they learn and when they learn. This disruption is causing many different reactions. 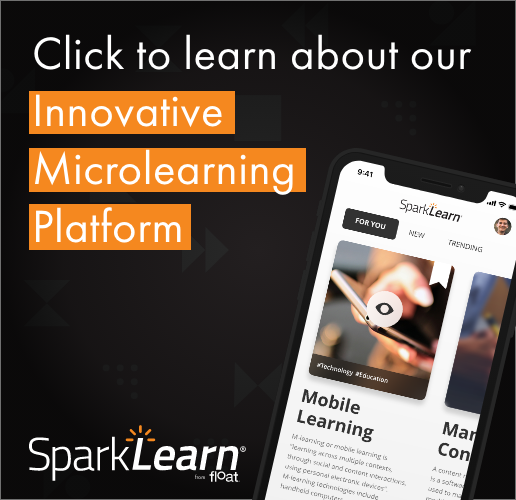 Next month’s newsletter will look at how companies and organizations can react positively in order to leverage the advantages mobile learning has to offer. In addition, there will be some tips on how to minimize any negative impacts that might occur as a result of the disruption caused by mobile learning.